Before I decided to prioritize my health, I weighed 226 pounds—I was at my biggest. And I wore a dress size of 22. My daily lunch consisted of McDonald’s; not just one meal, but an order of two-piece chicken with rice, a large coke, large fries, and a hot fudge sundae, plus an order of six-piece chicken nuggets whenever I was extra hungry. I would hide the trash so my parents wouldn’t see. The only physical activity I did was to walk to my car and to my classes. Exercise was not in my vocabulary. My wakeup call happened when I was teaching preschool kids, and I realized I couldn't go through my classes without losing my breath. A three-year-old student pointed it out to me. I realized I didn't want to go through my 20s unable to enjoy things because I was easily tired. I didn’t want to go through life huffing and puffing. Like so many, I’ve tried dieting and working out countless times before, but it never lasted more than a week. This time, though, it was different. I told myself that it was my last chance to do something about the state of my health. On April 1, 2013, I enrolled in a gym. I didn’t have a target weight. I just knew that it was now or never. Being a musician and a performer, work meant appearing on stage and seeing videos and photos of myself afterwards. I was uncomfortable, and I hated seeing post-event footage of my performances. But how can I be a good performer when I can’t even watch myself on stage? I asked help from a proper trainer and a nutritionist. To give myself some sense of accountability, I paid them in full several months in advance. Even after investing all that money, I kind of expected myself to fail because I was so used to trying half-heartedly—failure had been the norm for me. I chose to start on April 1 so that if I failed (again), I could always just say it was an April Fools’ joke. After all, I was the resident fat girl. As expected, my progress was slow in the beginning, but the people around me made sure I kept my goal. My trainer made sure I did different workouts everyday to surprise my body. We tried everything—from boxing, to circuit training, and even plyometrics. My nutritionist taught me the value of portion control and painstakingly helped me change the way I looked at food. For a while, I even continued to eat what I used to, but I cut everything in half. I slowly introduced veggies into my diet for more variation. I learned how to space out my meals and how to eat more but in smaller quantities. TBH, I hated it the first month, but I pushed through and went every single day. I whined and complained and kicked and cried but I showed up at the gym six times a week for two months straight. The slow and steady approach—sans a goal weight—allowed me to gradually change the way I felt about food and fitness. Without realizing it, I lost 20 pounds in two months. When you’re as big as I was, 20 pounds won’t be a significant change when you look in the mirror. But when someone else points it out, it’s like a huge breakthrough. I went back to school and a professor noticed how much weight I lost. After I hit the 25-pound mark, I was faced with a big obstacle. I went to Spain to take a music course for a few months. Suddenly, I didn’t have my regular exercise routine and meticulous meal planning. I regained a few pounds, but since my weight loss had come on so gradually, with my eating and exercise habits slowly evolving with my progress, I didn’t see it as a setback. When I came back home, I just went back to my old exercise and eating routine. I kept going for over a year. Three years have gone by, and I’ve kept the 90 pounds off. I’ve gone from a dress size of 22 to a size 8. I’ve achieved what I never thought I could. I’ve proven to myself that slow and steady wins the race and that good things take time. For anyone who wants to change, just make sure your commitment is part of your daily routine. Visualize your goals. More than anything else, I’ve learned that contentment is such a big factor when it comes to change; you have no idea how much loving yourself can do to instantly improve your well-being. These days, maintaining a healthy lifestyle, especially with a music career, involves a lot of give and take. If I know a particular gig involves a lot of food and alcohol, I make sure to put in the work the next day. Some months, I cut alcohol completely just to restart my system. Learn to just make better decisions and say, "Nah. Not today." I realize now that it’s not about being on a diet forever; it’s really about having a healthy, well-balanced lifestyle—carbs and beer included. And don’t forget: It's okay to set fitspiration goals, but I urge you to be your own peg. Imagine your future self and fight to get there. 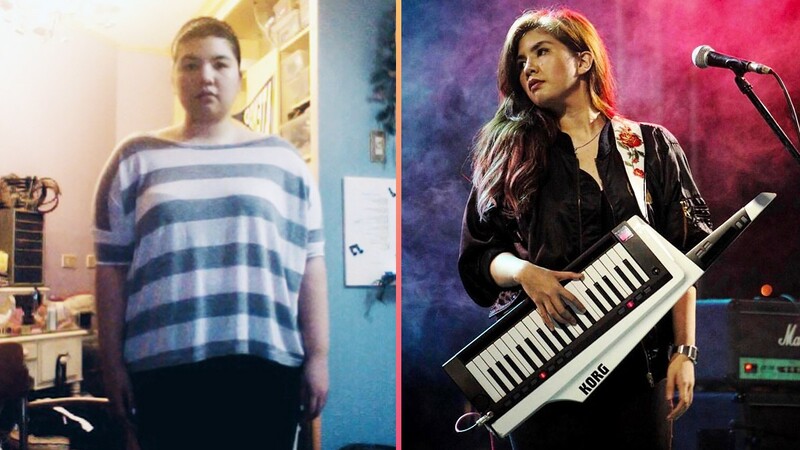 Kai Honasan is a musician. Follow her on Instagram.